I wasn't planning on posting this (hence the crappy phone picture below), but it was SO FREAKING GOOD that I decided to share the recipe. I recently bought a new pressure cooker, and BOY am I glad I did! It's a handy piece of equipment, easy to use and versatile. The first thing I made in it was brown rice, which took only 20 minutes to cook. I have plans to make pulled pork, pot roast, osso bucco, pork rillettes, and artichokes in it as well. 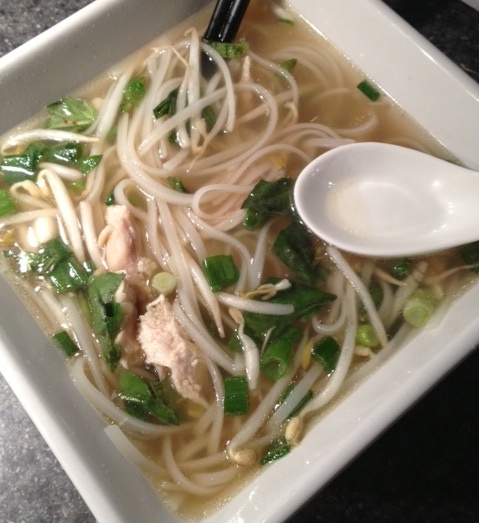 Sunday night, I made chicken broth for pho in less than an hour, something that would normally take at least three hours to cook! And it was SO DELICIOUS. Seriously. It tasted just like the pho I order at my favorite Vietnamese restaurants. * I used the bones from a leftover roasted chicken & picked all the meat off to use in my soup before making the broth. To make the broth: Toast the ginger, garlic, cloves, anise, cardamom & cinnamon in a dry pressure cooker pan over medium heat until fragrant (just a minute or two). Add the onion, chicken, fish sauce, and enough water to cover the ingredients. Be careful not to fill the pot more than 3/4 full. Close the lid & bring to pressure over high heat, then turn down to medium low & cook for 45 minutes to an hour. Release the pressure. Remove the large pieces from the broth (be sure to pick the cooked chicken off the bones, shred or chop, & set aside) and strain though a cheesecloth-lined strainer. To make a bowl of soup: Put noodles (as many as you'd like), shredded chicken, sprouts, green onion, and basil in a large soup bowl. Top with the broth and finish with the lime juice & soy sauce.